ST MICHAEL'S FLAGS seen in 1998 - Just five minutes walk from Victoria Station along Corporation St and Dantzic St, this is a very special place, one which preserves the atmosphere of the old Manchester. 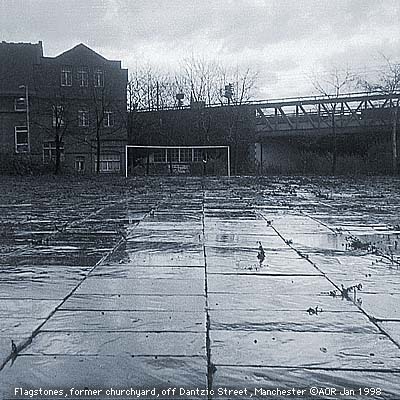 The flagstones are used as a childrens play area - a goalpost can be seen at one end. To the left is Charter St Ragged School, and to the right, the railway line from Victoria Station. "ST MICHAELS FLAGS" is a meaningless name now that the flagstones have gone. I was shocked to discover in early Feb 2001 that they had all been removed. St Michaels Church used to stand next to this open space, which was used as a plague burial ground. More information on the disappearance of the flagstones in a future update. Any information? Please contact. ST MICHAEL'S FLAGS, or at least all that remains of them after they were removed some time during the year 2000. This burial ground has many associations with the history of Manchester - St Michael's Church stood close to here until it was demolished about a century ago. Nearby were some of the worst slum dwellings in Manchester - they were removed in the 1930's. Commercial premises are still in use on the higher ground overlooking where the flagstones used to be. What has happened to the flagstones? Can anyone provide any information? Please contact. THE STEPS LEADING UP TO ST MICHAEL'S FLAGS are dirty, delapidated and strewn with rubbish. This spot, one of the most unique and historic in central Manchester is badly neglected. EWM says: Due to its associations with Manchester before and during the Industrial Revolution, health and sanitation, working class dwellings, the workhouse system, education and religion, this should be designated as an area of special significance and treated accordingly. CHARTER STREET RAGGED SCHOOL is seen here from the gravestones of St Michael's graveyard - St Michael's church was demolished around 100 years ago, but the gravestones remain as a poignant reminder of the impact of disease and short life expectancy in past centuries. THE ARNDALE CENTRE WINTER GARDENS are planned for this enclosure, where Cannon Street runs through the middle of the Arndale Centre. But as we can see, nothing has happened so far, and the ugly yellow tiles are still in place. This is how Cannon St looked on 31 January 2001. In the centre right can be seen the entrance to the former Arndale Centre bus station which was closed following the IRA bomb in 1996. Cannon St is currently an important interchange for buses serving north Manchester. The entrance ramp formerly provided vehicle access to the Arndale Centre car park - Manchester's cheapest and most central - but now it has been converted for use by pedestrians and wheelchair users. DISMANTLING OF BERNARD HOUSE has commenced, part of the renovation of the Piccadilly Plaza, being carried out in 2001. Bernard House is the shorter neighbour of Sunley Tower, one of Manchester's tallest office blocks. The buildings were named after Bernard Sunley, the owner of the development company which built Piccadilly Plaza from 1958 to 1965. Bernard House was one of the few 1960's buildings in Manchester to display any individuality or creativity. Its unusually shaped roof was unique. It is ironic that of all the post-war buildings in Manchester, this one has to go. THE MANCHESTER SHIP CANAL is seen here about half a mile downstream from Regent Road bridge, where the Irwell becomes the Ship Canal. The Pomona Docks, disused for many years, are on the right. We are standing on the Ordsall side, looking across to Cornbrook in the City of Manchester, and the railway viaduct from Central Station/GMEX, now used by Metrolink trams. In the nineteen-eighties, money and resources were spent on improving the river banks, providing embankment walkways, lighting, benches and flower beds. Unfortunately, regeneration was incomplete - the surroundings are mostly deserted, and few people come here. The lamp post, which bears the words 'City of Salford', is falling apart. WALKING ALONG THE MANCHESTER SHIP CANAL on the Ordsall bank, we take a look back towards Manchester city centre - Viewed from the south east, the clock tower of Manchester Town Hall stands out on the horizon. Sunley Tower is partially hidden by the railway viaduct on the right. It's a shame that this area is mostly deserted. A wide expanse of water, perfect for regattas or other water events, lies empty and unused. It provides a peaceful haven for swans, seagulls and other waterfowl. WE ARE LOOKING FROM THE SALFORD SIDE of the Manchester Ship Canal towards Manchester city centre. Pomona Docks are on the right - railings and lamps have been installed, but so far no new buildings occupy this potentially spectacular waterside location. The railway viaduct from Central Station/GMEX and Knott Mill/Deansgate stations can be seen on the right - a Metrolink tram speeds towards the city centre, passing the clock tower of Manchester Town Hall. The white building far left is Sunlight House, Quay St, and to its right, the Bank of England extension on King St.
WE ARE IN OLD TRAFFORD close to Manchester United football ground. Looking north east along Chester Road, there is a striking zoom view of Manchester city centre, approximately two miles (3.5 km) away. City centre buildings visible include Sunlight House (far left), the Bank of England extension (centre left, with green windows), next to it Ship Canal House, and the black roofed outline of the Midland Bank, both on King St. The dark form behind them is Lowry House, on Spring Gardens. To the right of Manchester Town Hall is the roof of the town hall extension. An ambulance has its lights flashing and is on a callout. In the fifties, the 'Busby Babes' used to walk from Old Trafford into the city centre - nowadays the young MUFC superstars whizz by in their Maseratis and Lamborghinis.